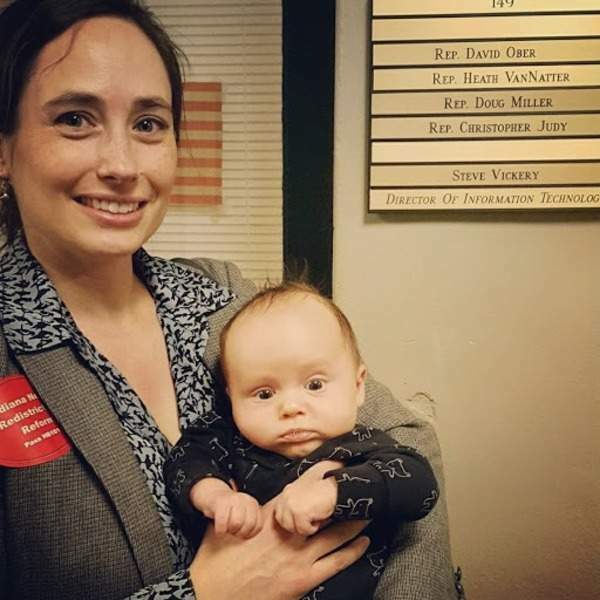 Fort Wayne resident Karen Eller made the trip to the Indiana Statehouse Wednesday with her eight-month-old son to show support for House Bill 1014. Karen Eller is plenty busy as the mother of a toddler and an eight-week-old. But the Fort Wayne resident’s support for redistricting reform is so strong she felt compelled to drive to the Statehouse Wednesday for a hearing on House Bill 1014, legislation to establish an independent redistricting commission. Eller has followed the issue since last summer, when she attended a session of the interim study committee on redistricting and heard Michael Li, a redistricting expert with the Brennan Center for Justice, talk about the effects of gerrymandering. “Specifically for Indiana, I think passing a citizen-led redistricting effort would be a breath of fresh air to the current political climate, bolstering the spirits of voters, and making us feel like our representatives are there to work for us – and that they have really delivered a ‘win’ for the people,” Eller wrote in an email. Unfortunately, that win is slipping out of reach. Eller and hundreds of other redistricting reform supporters packed the House chamber last week after HB 1014 was hastily scheduled for a hearing, but Elections and Apportionment Committee Chairman Milo Smith, R-Columbus, listened to testimony from 34 supporters – and a single opponent – before indicating he wouldn’t call the bill for a vote. Unless he reverses his position and calls it on Monday, months of work by the study committee and efforts by Eller and others will prove for naught. Eller said her own representative, Republican Christopher Judy of Fort Wayne, met with her before the hearing Wednesday. It’s telling that a member of the Elections and Apportionment Committee didn’t know much about redistricting and hadn’t read a high-profile bill scheduled for a hearing in that committee. Judy’s District 83 seat is a prime example of Indiana’s uncompetitive districts. In four elections, his only contested race has been the 2014 Republican primary in which he defeated incumbent Rep. Kathy Heuer. Call Smith at 317-232-9620 and urge him to call HB 1014 for a vote. If Indiana lawmakers believe the districts they drew themselves are fair and representative of Hoosier voters, they should be comfortable with districts drawn by an independent citizen commission.